Project Apricot is a nickname of a physics project that Adam Krellenstein and Ian McEwen used to work on, primarily in room CSC B17 (an optics lab in the basement of Cole). The project focuses on investigating the nature and properties of two different kinds of high-temperature, stable plasmas that may be created in the presence of high-density electromagnetic radiation in the microwave range. There are principally two sorts of the plasma. The first is type A, which is hotter, more colourful, more centralised and more volatile; the other is type B, which is cooler, fluorescent purple, more diffuse and more stable. Type A plasma is created at around one atmosphere of pressure. Type B is created only in (partially) evacuated chambers. The first of these phenomena, type A, was first discovered (in the context of this experiment) by James Moore, a UMASS student and high school sweetheart of Adam. The story goes that James called him up at 2AM because he was so excited. Adam, being the curious cat he is, drove to James’ house immediately, to discover that no adults were home and James had been spending the last few hours sticking paper clips and empty root beer bottles in his mother’s microwave oven. That was junior year (2006?). James and Adam then spent the next two years studying the phenomena on-and-off, partially through their high school’s Science Research program. James quit the project soon after he arrived at UMASS in 2007. Geo’s magnetron: it’s small, but it should work. 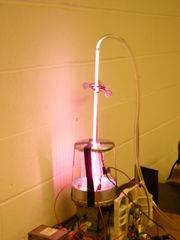 February 29: Adam and Fred set up the apparatus that was built over the last summer vacation for producing the plasma, which they saw immediately inside a frosted light bulb placed in the reaction chamber. Leaving Cole, Adam went to Lemelson and built two more Faraday Cages for extra safety and flexibility. November 10: Ian and Adam begin work. We talk to Fred, then they dissect the microwave which Trevor LeBlanc found by a recycling shed and donated. Below are photographs of the event. Ian and Adam took apart this microwave to extract a magnetron to replace the one that Adam broke last fall. They also stole the fan for extra cooling. November 24: Adam stops by K2 to nab a working microwave which Geo has been keeping safe. He takes it apart and steals the magnetron. Money from NS buys us a share of 24 500ml Pyrex boiling flasks, 24 250ml boiling flasks, two sizes of rubber stoppers (with holes) and 10 glass NMR tubes. What type B looks like at (relatively) high pressure and full power. This shot was taken right before the flask popped. With new magnetrons and voltage-doubling circuits at hand, Adam and Ian begin a formal independent study during January Term 2009, under the supervision of Fred Wirth. Jan. 5: Adam and Ian clean their lab space and try replacing the broken magnetron from S08 with the two new magnetrons recently acquired. No changes were made to the voltage-doubling circuit, which was proved, with a multimeter, to still be working. It is conjectured that the reason that Geo’s magnetron didn’t work was it needed a different circuit to power it because it’s small. Jan. 6: Field trip! Adam and Ian drive into Northhampton and purchase two microwaves, one which worked (Bertha) and the other which didn’t (Overpriced). Later in the day, Adam and Ian take these microwaves apart and salvage not only their magnetrons, but also their circuits and fans. Bertha in the old circuit: failed. Bertha in Bertha’s circuit: failed. Try with Overpriced’s circuit and magnetron: failed. Try Bertha again with Bertha’s circuit. Success! Grounded were: Transformer, diode, magnetron, and not capacitor. Try with Bertha’s magnetron, the old circuit and proper grounding: failed. Go back to using Bertha’s magnetron and Bertha’s circuit, with the whole thing properly attached to the apparatus using zipties, cardboard, screws, and tape: Success! Checked radiation levels. Note that magnetron starts to produce radiation when Variac is at 80%. Jan. 8: The glassware has still not arrived, so Adam and Ian try to make type A plasma with paperclips. A crude attempt was made to map out the electromagnetic field by recording where the paperclips had to be in the Faraday cage in order to arc and create the plasma. A preliminary conclusion was that a paperclip hanging from the ceiling of the cage at around 8 cm from the base of the magnetron was ideal. Jan. 12: Adam and Ian start work late. Some of the glassware has arrived. All ten of the NMR tubes are here, along with the stoppers and one of each size of boiling flask. Adam and Ian realise that neither flask fits in the Faraday cage they had been using. They resolve to make new ones. 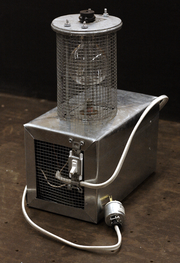 Jan. 13: They go to Lemelson and build new Faraday cages which will fit the new glassware. They take an old, wide Faraday cage which is 3L in length and cut it into two cages, one 2L and one L in length. These wide cages can fit both the 500 and 250 mL flasks. They hacksawed some jagged edges off of Bertha’s magnetron: they caused sparking and prevented the larger cages from fitting on it. Jan. 14: Adam and Ian try to make type A plasma with paperclips inside of the 250 mL. They break the flask by placing it upside-down over the antenna. 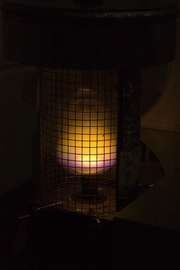 Jan. 15: Started with evacuated NMR tubes and produced type B plasma. This plasma increases in length and brightness as the variac’s power is turned up. At highest setting, sparking between the tube and the cage caused an air leak, however at no point did the tube melt because of the temperature of the plasma itself. They want to try using multiple NMR tubes in different sized Faraday cages. Then they replace the NMR tube with the 500 flask. After some struggling to evacuate the larger chamber, Adam and Ian succeed in producing type B plasma in it. This looks awesome! The plasma is definitely most dense near the surface of the flask. The density of the plasma also varies across the surfaces (i.e. it is a different lumosity near the stopper Important properties of this plasma: as voltage decreases and/or pressure increases, the plasma creeps down the sides and the lumosity decreases. And vice-versa. When the variac is set below about (roughly) 80%, the plasma disappears. At the end of the day, Adam and Ian turn up the pressure really high to see what will happen. Accidentally, they create what looks to be type A plasma in the center of the flask, just as the type B has almost disappeared. Unfortunately, almost as soon as this occurs, the Pyrex breaks at the point where it touches the antenna. A case of ‘do or die’. Jan. 16: Cleaned. A lot. Added another fan to the apparatus, to cool the glass better. Jan. 19: Adam and Ian try to produce type A in a light bulb, with moderate success; but the bulb is rapidly destroyed by arcing. Then they try to create plasma B with last Pyrex beaker (for documentation purposes). While photographing the phenomenon, it is discovered that the plasma is only extant for extremely short periods of time (on the order of a thousandth of a second). This is deduced when photographs at high shutter speed end up black. It is decided we need video to further examine the phenomenon. It is also observed that low-energy (that is, low-lumosity and smaller-volume) plasma is more difficult to reach at this point; the reason for this is decided to likely be the heating of the Pyrex over time, possibly by way of a change of conductivity. This agrees with a previous observation that the quality of plasma B was different next to different materials (ground versus smooth glass), another factor changing conductivity. It is observed that at higher pressure, the voltage at which plasma continues to exist can be lower. It is also observed that at 100% voltage, the total area of the plasma is smaller than at 85%. Finally, as with previous experiments, the Pyrex was broken when the plasma started to exhibit tendencies of Plasma A. The breaking of the Pyrex appears to happen under these conditions: 85-90% voltage and increased pressure; at a lower setting on the variac (varying pressure) or at lower pressure (varying voltage) we simply get a smaller amount of blue plasma (Plasma B) with higher pressure/lower voltage. Adam and Ian sealed the cracks in the bottom of this beaker with epoxy; some future day this beaker can be used again. Feb. 16: Began construction of the Mark II. Successfully set-up a second, independent microwave-producing circuit! Write shopping list. They put all of this together and destroy two more 250ml boiling flasks. Before they do, they manage to see some really cool plasmas which look a lot like type A. Also, they noticed that the flask does not have to be touching the magnetron antenna in order to produce type B plasma. They decide to: 1) Cut hole in new Faraday cage cap so that they may use 500ml flasks too; 2) Figure out how not to create type B without being connected to vacuum pump. Feb. 22: Go to Lemelson and continue to build Mark II. Decide we need threaded rods as scaffolding. Feb. 24: Buy threaded rods, epoxy, more tubing, nuts and washers. Mar. 9: Build boxes for capacitor and entire apparatus. Mar. 10: Attached threaded rods and misc. Mar. 12: Riveted transformer and capacitor down. Mar. 27: Tested Mark II in Cole’s basement: the aparatus works as designed; the fan is attached poorly; the hose clamp Adam borrowed from Jagu doesn’t work with our new tubing (which seems a little inflexible). Apr. 7: Fixed the fan and started the wiring. Apr. 9: Attached the switch and finished the wiring. Everything is done except for the grating. Apr. 16: Finished Mark II by attaching side grating! Spent some time in Cole talking to Naya about cooling mechanisms and Firefly. Apr. 23: Lots of photography and some video-taking. May 5: Clean up for the year. Unknown: Adam does a few demonstrations to various people, e.g. his future physics 2 class. Unknown: In demonstrating the Mark II’s functionality again, he realises it has stopped working when it sparks dramatically and fails to turn on. Adam does some preliminary troubleshooting. Two days later: Ian and Adam fix a bad part of the circuit. All is well again in the basement of Cole. Except the mess. Dec. 16: Adam, Ethan and Kevin run the apparatus for the lolz, then clean up *everything*, disassembling the Mark I and organising all of our parts in the newly purchased tupperware. Jan. 8: Adam and Ian disassemble nine microwaves for their circuits. Jan. 23: Adam and Ian first seal up the joints on the Mark II brass top in an attempt to improve the airtightness of the thing (perhaps so it can be used without a vacuum pump for demonstrations). Then, they drive to Westfield in order to buy two tanks of Helium. The plan is to use spectroscopy as well as venting-in of the helium gas at various pressures to test the phenomenon quantitatively. They also plan to meet twice a week during Spring 2010. Jan.: First try venting in Helium. Mostly null results. Feb. 10: Adam does an impromptu presentation of the Mark II for the Smith physics majors.